Bible prophecy is what this website is all about. It will tell you every thing you desperately need to know about Bible Predictions concerning the United States. Bible prophecy is not scary if you know Jesus Christ. He is full of hope and love! Bible prophecy contains God's loving warning message of His coming judgment of the world. Prophecy contains not only a warning message but instructions on how You and your family can be be saved from this coming judgment. God doesn't want you or your family to be part of it! You'll learn about the events in the Book of Revelation, the end times, the coming tribulation, the antichrist, 666, the mark of the beast, the rapture, Mystery Babylon, the New World Order (NWO), the one world religion, World War 3 and the satanic organization behind much of the NWO planning, the Illuminati. 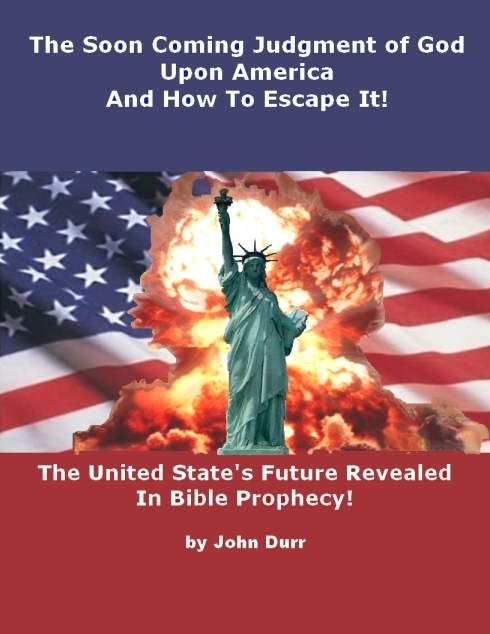 You'll learn that Bible prophecy predicts the destruction of the United States. You'll learn why the U.S will be destroyed and most importantly what you can do to be saved from this soon coming destruction of America. You may have heard of a Bible code; such a code exists. But where should you focus your attention. God said that His warning messages come through prophecy and that anyone who studies the Book of Revelation will be blessed! The Soon Coming Judgment of God Upon America And How To Escape It! A Prophetic Warning to the United States From Bible Prophecy - Confirmed by U.S. History and Current Event! This book is a revelation warning concerning the United States from God's word. You'll be amazed at what God has to say about the United States and how accurately he describes her in Bible prophecy. For the first time America's little known history is used to prove that America is the Babylon of Revelation 17 and 18 which God will destroy! This little known history is well documented using hundreds of published books and articles as sources. This may be the most important book you'll ever read. The fact that the United States is Babylon is very important to know because according to Bible prophecy, God will destroy Babylon and therefore the United States of America! This may be the most important book you'll ever read. Many today are awaiting the return of Christ and the fulfillment of Bible prophecy. They are looking for signs in the heavens and the earth. They are looking for evidence of end time events in the global news. They are looking for signs that we are in the end times (the last days), that the tribulation is about to begin and the antichrist revealed. But they are not looking for signs of the United State's approaching judgment as confirmed and predicted in Bible prophecy. The New World Order Beast will be identified with the number 666. The leader of the New World Order (NWO), the antichrist, will usher in the mark of the beast. His false prophet will declare himself to be God even Jesus Christ. But they will both represent the Red Dragon, Satan. They will seek to destroy God's true apostolic church, God's faithful followers, a remnant from among Christians. But what most don't understand is that the NWO, which the antichrist will control, is being largely setup and funded by the United States. Further, this is a fulfillment of Bible prophecy. These prophetic events and much more can be found in scripture, in Bible Prophecies. Many of prophecy's end time events are well known by millions but very few know how the United States is described in Bible prophecy. A new eBook, The Soon Coming Judgment of God Upon America And How To Escape It, has been written in order to change this. Reader's of this two volume prophetic series will be brought to a new depth of knowledge concerning Bible prophecy's end time events, particularly as they involve the United States. It will be clearly demonstrated from scripture and the word's of Jesus Christ that many living today will witness the fulfillment of Bible prophecy. They will witness the great falling away, the apostasy, the tribulation, the mark of the beast, plagues, World War 3, the apocalypse, Amageddon, the second coming of Jesus Christ, the rapture, and the new millennium. This event which Jesus asked us to look for was fulfilled in 1917 when the Jewish people (the fig tree) began to return to the nation of Israel. My eBook completely explains why this event fulfilled Jesus' prophecy. It also demonstrates that in Exodus God said a generation equaled 100 years. Now Jesus further stated that after this event occured, there would be signs in the earth. These included: “wars and rumours of wars”, and “famines, and pestilences, and earthquakes, in divers places” (Matthew 24:6-8). The timing of Christ's return is particularly relevant to the study of the identiy of Babylon because Babylon is destroyed before Jesus returns in the clouds. In Revelation 18:4 God is calling His people to come out of Babylon so that they can be protected from the coming destruction. But before one can come out of Babylon, one must know that they are living in Babylon. They must also know what it means to come out. This is the purpose of this two volume series on the United States in Bible Prophecy. You will be totally convinced that America is Babylon and you'll know how to come out. For further information and a more indepth description see my sales-page. Donations for this vaulable life changing and life saving prophecy series are backed by an unconditional 30-day money back guarantee. If for any reason you are not satisfied with "The Soon Coming Judgment of God Upon America And How To Escape It" you can request a full refund by emailing me with your name, receipt number and donation date. The unconditional 30-day money back guarantee is not valid for donations that are less than $5.00. You can purchase both books and learn more about them by going to the sales-page. If you are interested in an in depth look at what you'll find in this two volume eBook series you can read a Summary of the United States in Bible Prophecy. In this summary you'll read about God's love and how He uses judgment to bring sinners to repentance and eternal salvation. There is also a very revealing summary of how God describes Babylon, you won't want to miss this! Finally, the two Volumes are broke down section by section with a synopsis of the topic of each section and a short description of each chapter. Note: The following excerpts are in various formats. Some of the files have format errors that occurred during conversion from Microsoft Word. The down- loadable PDF files are of much higher quality. See the Prophecy News Archive for news stories related to Bible prophecy and Prophetic Dreams and Visions about the future of the United States.